If you have ever been in a situation where you just cannot find an insulation product that will fully meet all your requirements and set standards, then you have come to the right place. Namely, combining different insulation and construction materials has now become a very common appearance due to the fact that, as good and efficient available insulation products are, it is not that always easy to find the one that will suit all your needs. 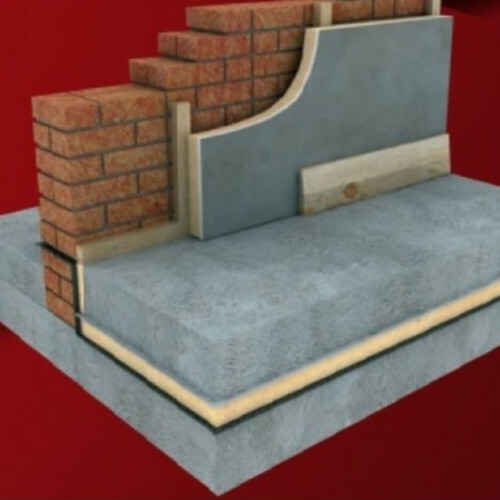 Basically, some materials have high insulation values, but are not as moisture tolerant, while others are easy to install and maintenance free but are not as flexible and compatible. This is why Insulation Shop is now offering insulation laminating and cutting service, all in order of being able to fill your each and every request to the max. Our services include insulation laminating and cutting an entire spectrum of different materials and creating versatile insulated and composite panels or laminated sandwiches with different characteristics and applications. You can determine different parameters including durability, strength and stability, weight, thickness, colour, finish and thermal properties of the product you want us to design, laminate and cut to the desired size. This means no labour costs and no waste, since our complete insulation laminating and cutting service will make sure that all you have to do is make your choice and let us handle the rest. Our laminating service includes bonding any type of insulation to other materials, either on one or both sides. 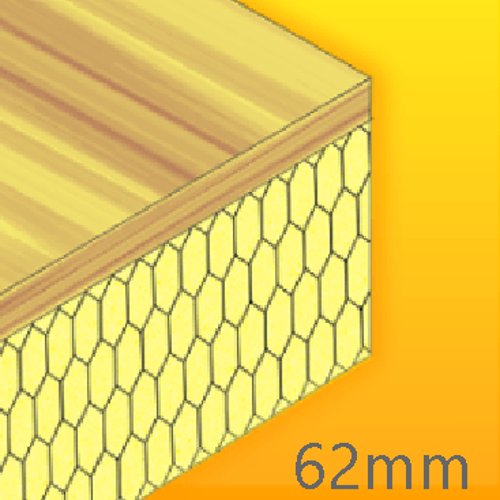 This means that you can choose from a handful of different materials, from creating insulated plasterboards by bonding some insulation (such as phenolic or PIR insulation) to gypsum plasterboards for your solid walls or drylining project, over composite insulated panels consisted of PIR core bonded to OSB boards to laminated sandwiches made from PUR core and metal sheeting. By simply choosing some combination, you will be able to influence and determine the mechanical strength, fire and moisture resistance and insulation properties of the composition. 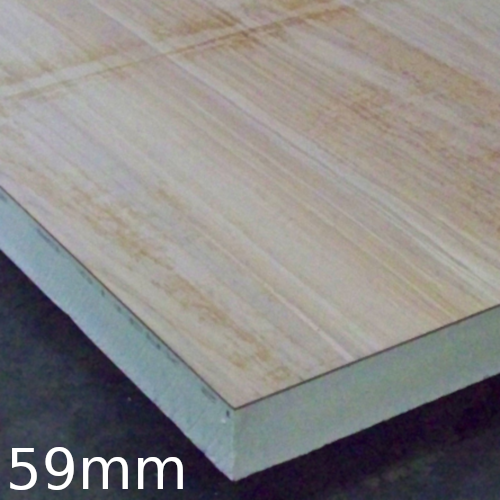 In order of gaining a product you can really rely on, all you have to do is fill our quoter that is choose the insulation core and its thickness, the material you want to bond the insulation to, either on one or both sides, quantity and size and send the quotation request to us and we will take care of the rest. Please contact us for detailed information on the price. Contact us if you need a quote for any type of insulation laminates on 02033972133. 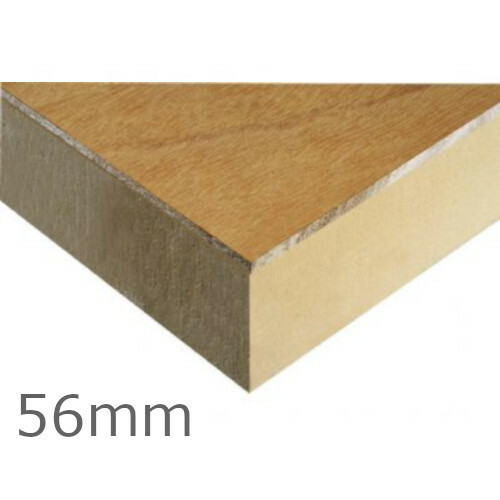 56mm Kingspan Thermaroof TR31 is the flat roof insulation comprising a high performance rigid PIR thermoset insulation core faced with an FSC certified 6 mm nominal thickness WBP exterior grade plywood on its upper surface and a low emissivity composite foil facing on its lower surface. 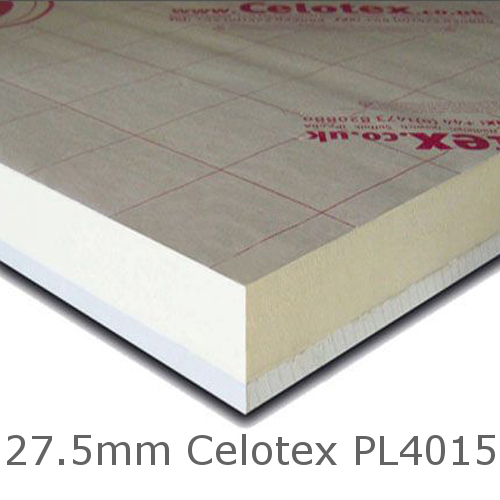 T..
Celotex GD5025 is a premium performance PIR insulation bonded to 12.5mm tapered edge plasterboard. Allows for the installation of both the insulation and plasterboard in one operation, thereby reducing installation time. 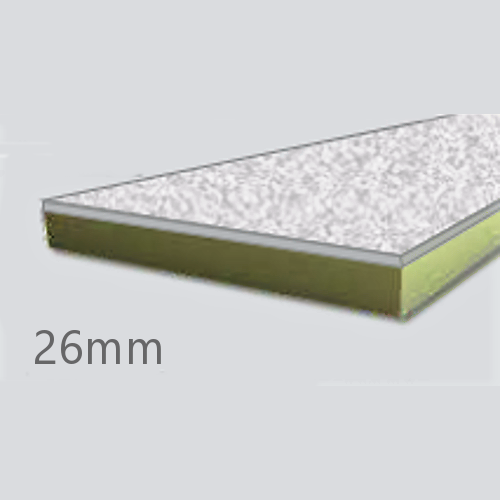 Simplifies compliance to current building regulations for the upgrade of intern..
Celotex GS5025 is a premium performance PIR insulation board faced with low emissivity aluminum foils on both sides and bonded to 9.5 mm tapered edge plasterboard, providing an insulation product and a plasterboard in one. The product is designed for mechanically fixed applicatio..
Xtratherm Plydeck is a composite insulated panel of Xtratherm Polyisocyanurate core with a composite foil face, bonded to 9mm OSB board. The Xtratherm Plydeck provides a high level of thermal insulation and decking in one application.APPLICATIONPlydeck is designed to provide high levels of thermal i..
96mm Recticel Plylok PIR Flat Roof Insulation Board is a rigid PIR board consisted of a few bonded elements contributing to its thermal performance and rigidity. 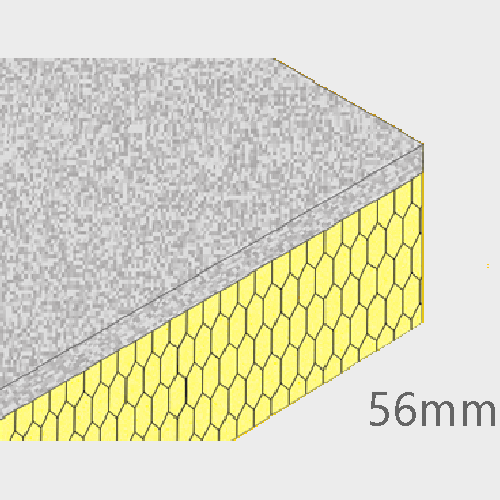 The closed cell rigid PIR foam core is faced on both sides with multi-layer aluminium foil and bonded to 6mm WBP plywood. 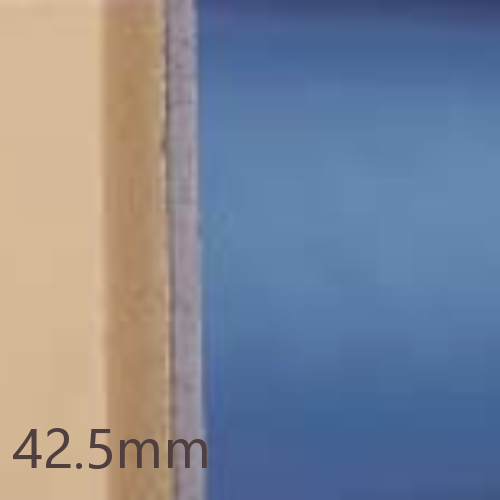 It is espec..
24.5mm Xtratherm Thin-R Thermal Liner XT/TL-MF is a composite insulated panel of 15mm Xtratherm Polyiso (PIR) core with foil faces bonded to 9.5mm tapered edge plasterboard for mechanically fixing to internal walls. 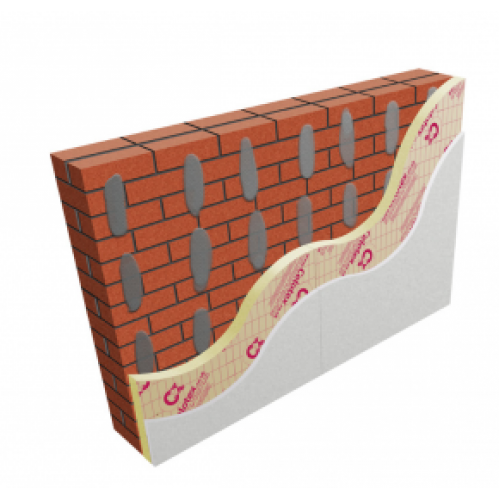 XT/TL-MF is designed to provide high levels of thermal insulation and dry ..
27.5mm Xtratherm Thin-R Thermal Liner XT/TL-MF is a composite insulated panel of 15mm Xtratherm Polyiso (PIR) core with foil faces bonded to 12.5mm tapered edge plasterboard for mechanically fixing to internal walls. 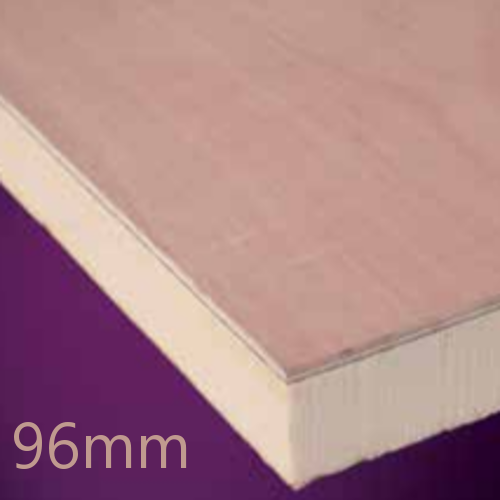 XT/TL-MF is designed to provide high levels of thermal insulation and dry..
24.5mm Xtratherm XT/TL Thermal Liner Dot and Dab Insulated Plasterboard is a high performance rigid insulation board made from 15mm Xtratherm PIR core faced with composite kraft paper bonded to tapered edge 9.5mm plasterboard, specially designed for internal walls dry lining and insulation..
27.5mm Xtratherm XT/TL Thermal Liner Dot and Dab Insulated Plasterboard is a high performance rigid insulation board made from 15mm Xtratherm PIR core faced with composite kraft paper bonded to 12.5mm plasterboard, specially designed for internal walls dry lining and insulation, due to its..
37.5mm Xtratherm Safe-R Thermal Liner SR/TB is a composite insulated panel of Xtratherm 25mm Phenolic core with a composite tissue facing bonded to a 12.5mm tapered edge plasterboard for internal applications,fixed with dot & dab adhesive bonding. 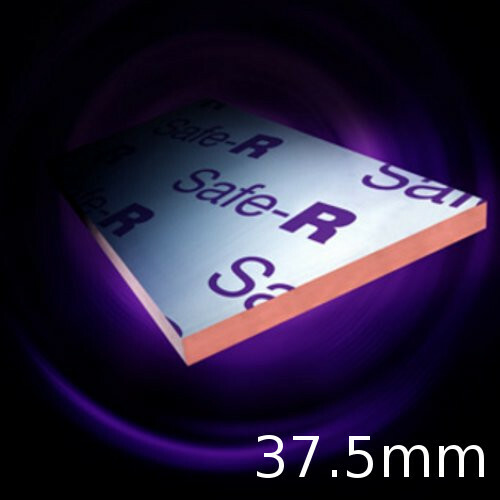 Xtratherm Safe-R Thermal Liner SR/TB is designed..
37.5mm Xtratherm Safe-R Thermal Liner SR/TB-MF is a composite insulated panel of Xtratherm 25mm Phenolic core with a composite tissue facing bonded to a 12.5mm tapered edge plasterboard for internal applications, mechanical fixed. 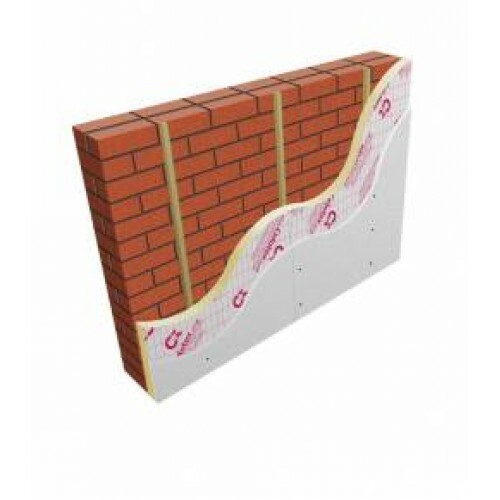 Xtratherm Safe-R Thermal Liner SR/TB-MF is designed to provide high l..
22mm Knauf EPS Thermal Laminate Insulation Board is a perfect solution for insulation and drylining in walls and warm roof constructions, in both remodelling and new build projects. 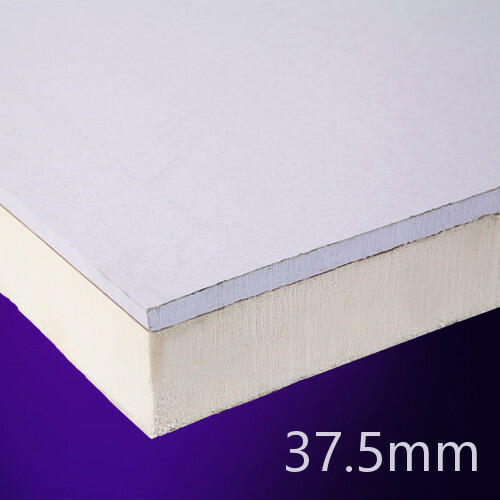 Consisting of 9.5mm tapered edge wallboard bonded to expanded polystyrene, offering great thermal and a level of acous..
42.5mm Polyfoam Linerboard is a high performance, tapered edge, rigid composite internal insulated plasterboard with 30mm extruded polystyrene (XPS) bonded to 12.5mm plasterboard. 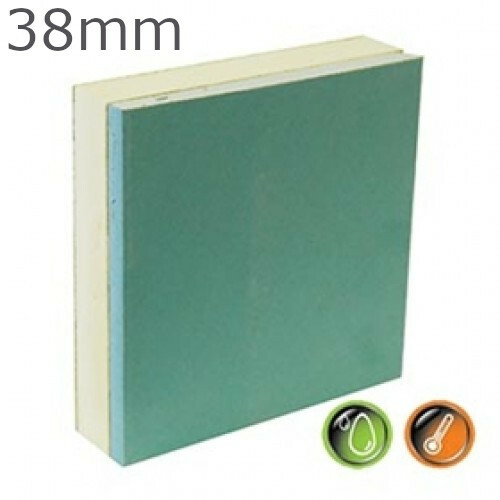 It allows the thermal insulation and lining of internal, semi-exposed and exposed walls in one simple operation.&nb..
37.5mm EcoTherm EcoLiner is a range of thermal laminate boards designed for both new build and refurbishment projects, applicable for internal wall insulation and drylining, but also pitched, cold and room-in-roof applications. 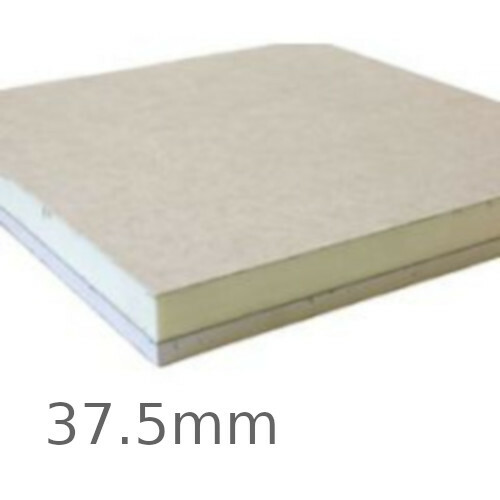 It is consisted of paper backed PIR insulation core bonded to ..
96mm EcoTherm Eco-Deck is a tough, structural, pre-insulated thermal composite board for flat roofs. 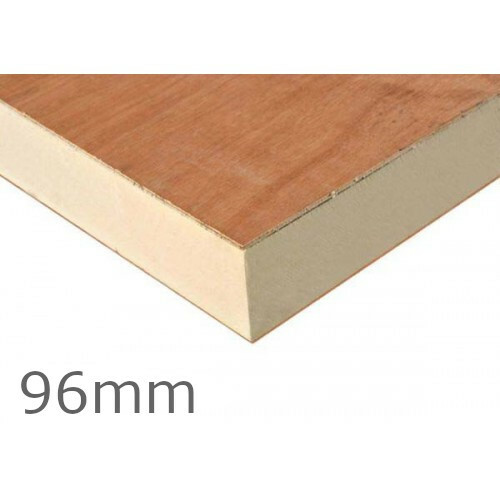 It comprises a 90mm thick fibre free polyisocyanurate (PIR) insulation core faced with 6mm thick tough, exterior grade plywood and is ready to fix and finish using basic tools and traditional roofing..
27mm Gyproc Thermaline Plus is a Gyproc wall board factory-bonded to an expanded polystyrene insulant that is both CFC and HCFC-free. 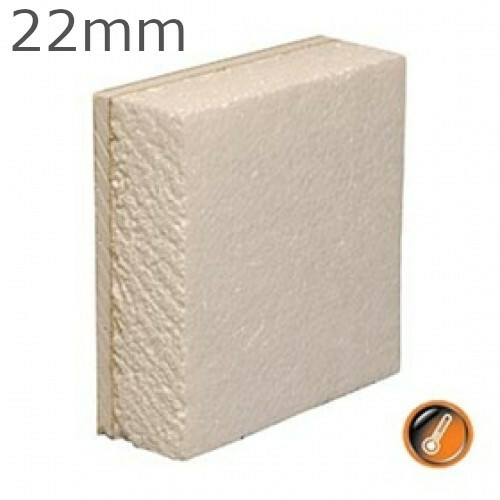 The Gyproc board consists of an aerated gypsum core encased in, and firmly bonded to, strong paper liners. The expanded polystyrene insulant is then furthe..
22mm Gyproc Thermaline Basic is a Gyproc wall board factory-bonded to an expanded polystyrene insulant that is both CFC and HCFC-free. 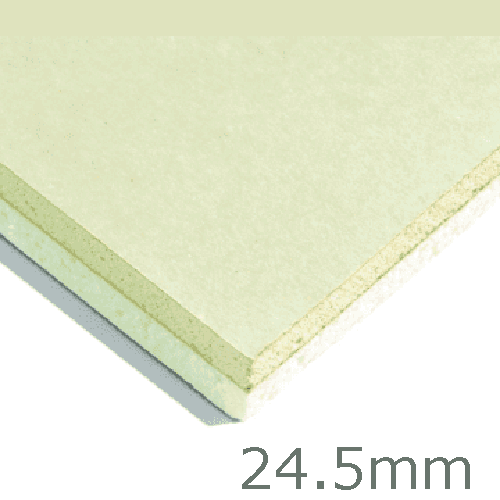 The Gyproc board consists of an aerated gypsum core encased in, and firmly bonded to, strong paper liners. The expanded polystyrene insulant is then further bo..
50mm Gyproc Thermaline Super Insulated Plasterboard is a highly efficient rigid WallBoard board bonded to phenolic foam insulant offering vapour control and fire resistance. It is also highly environmentally friendly, manufactured without harmful agents such as CFC and HCFC. 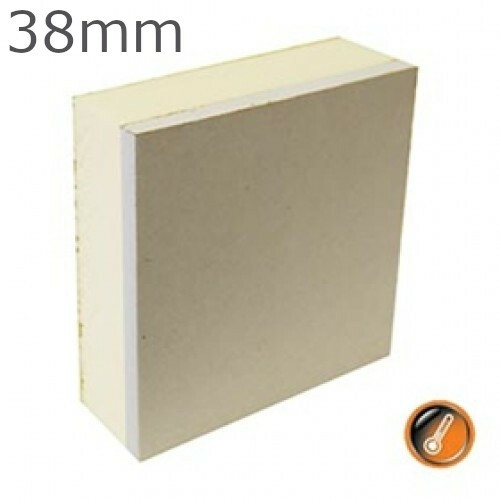 The ..
38mm Gyproc Thermaline PIR Insulated Plasterboard is a highly efficient board consisting of carefully designed components, offering not only insulation, but also vapour control and fire resistance. 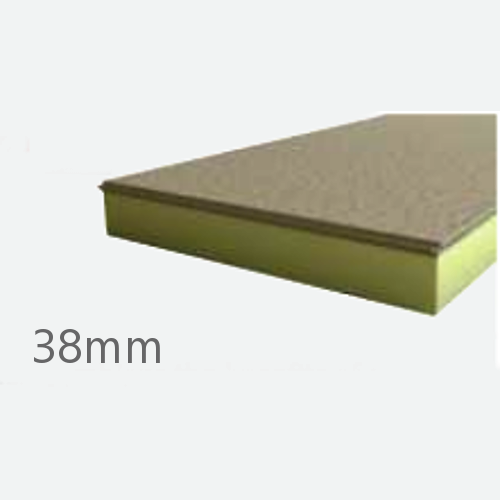 It consists of a rigid WallBoard bonded to a PIR foam insulant with a double control va..
38mm Gyproc Thermaline PIR MR Insulated Plasterboard is a highly efficient board consisting of carefully designed components, offering not only insulation, but also vapour control and fire resistance. It consists of a rigid Moisture Resistant board bonded to a PIR foam insulant with a doub..
37.5mm Speedline Thermal Laminate Board is a 2 in 1 solution -- dry lining and thermal insulation-- in one single application. 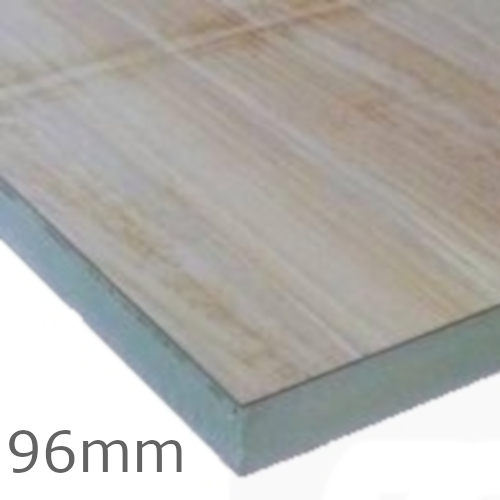 This thermal laminate board comprises a PIR foam with a kraft paper/aluminium multilayer finish, factory bonded to a 12.5mm tapered edge plasterboard. 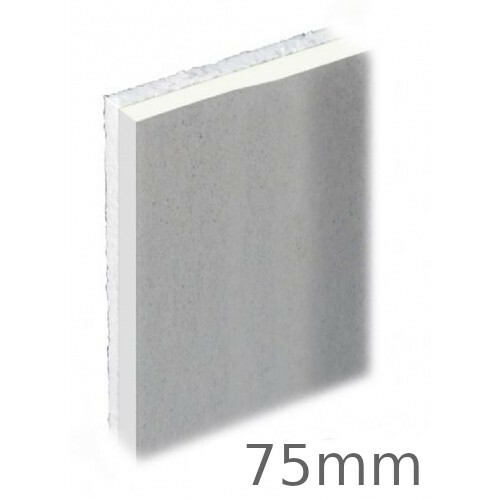 The PIR foam has a ver..
75mm Knauf PIR Thermal Laminate Insulation Board is a 9.5mm tapered edge wallboard bonded to PIR insulation, offering great thermal and a level of acoustic insulation, perfect solution for insulation and dry-lining in walls and warm roof constructions, in both remodelling and new build projects..